The Purple Heart is a United States military decoration awarded in the name of the President to those who have been wounded or killed while serving on or after 5 April 1917 with the U.S. military. The National Purple Heart Hall of Honor is located in Newburgh, New York. The Purple Heart is the oldest symbol and award that is still given to U.S. soldiers in service, surpassed in history only by the long obsolete Fidelity Medallion. … Above the heart appears a shield of the Washington coat of arms (a white shield with two red bars and three red stars in chief) between sprays of green leaves. The reverse consists of a raised bronze heart with the words FOR MILITARY MERIT below the coat of arms and leaves. The ribbon is 1 and 3⁄8 inches (35 mm) wide and consists of the following stripes: 1⁄8 inch (3 mm) white 67101; 1 1⁄8 inches (29 mm) purple 67115; and 1⁄8 inch (3 mm) white 67101. As with other combat medals, multiple awards are denoted by award stars for the Navy, Marine Corps, or Coast Guard, or oak leaf clusters for the Army and Air Force. Intrinsically, the Purple Heart is the world’s costliest military decoration – nineteen separate operations are required to make it from the rough heart stamped from bronze to the finished medal, plated with gold and enameled in various colors, suspended from a purple and white ribbon. The original Purple Heart, designated as the Badge of Military Merit, was established by George Washington—then the commander-in-chief of the Continental Army—by order from his Newburgh, New York headquarters on 7 August 1782. General Washington is often pictured as a cold, stern soldier, a proud aristocrat, a martinet. Perhaps he was all of these at times. Yet we know he showed sympathy and concern for his troops, and was not too proud to pray, humbly on his knees, for his beloved country and for the men who served it, and him, so bravely and loyalty. His keen appreciation of the importance of the common soldier in any campaign impelled him to recognize outstanding valor and merit by granting a commission or an advance in rank for the person concerned. In the summer of 1782 he was ordered by the Continental Congress to cease doing so – there were no funds to pay the soldiers, much less the officers! The Badge of Military Merit was only awarded to three Revolutionary War soldiers and fell into disuse following the War of Independence. Although never abolished, the award of the badge was not proposed again officially until after World War I. On 10 October 1927, Army Chief of Staff General Charles Pelot Summerall directed that a draft bill be sent to Congress “to revive the Badge of Military Merit”. The bill was withdrawn and action on the case ceased on 3 January 1928, but the office of the Adjutant General was instructed to file all materials collected for possible future use. A number of private interests sought to have the medal reinstituted in the Army. One of these was the board of directors of the Fort Ticonderoga Museum in Ticonderoga, New York. On 7 January 1931, Summerall’s successor, General Douglas MacArthur, confidentially reopened work on a new design, involving the Washington Commission of Fine Arts. This new design was issued on the bicentennial of George Washington’s birth. Elizabeth Will, an Army heraldic specialist in the Office of the Quartermaster General, was named to redesign the newly revived medal, which became known as the Purple Heart. 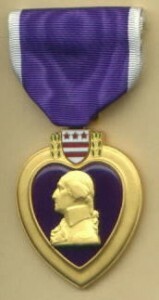 Using general specifications provided to her, Will created the design sketch for the present medal of the Purple Heart. Her obituary, in the 8 February 1975 edition of the Washington Post newspaper, reflects her many contributions to military heraldry. The Commission of Fine Arts solicited plaster models from three leading sculptors for the medal, selecting that of John R. Sinnock of the Philadelphia Mint in May 1931. By Executive Order of the President of the United States, the Purple Heart was revived on the 200th Anniversary of George Washington’s birth, out of respect to his memory and military achievements, by War Department General Orders No. 3, dated 22 February 1932. The criteria was announced in War Department circular dated 22 February 1932 and authorized award to soldiers, upon their request, who had been awarded the Meritorious Service Citation Certificate, Army Wound Ribbon, or were authorized to wear Wound Chevrons subsequent to 5 April 1917, the day before the United States entered World War I. The first Purple Heart was awarded to MacArthur. During the early period of American involvement in World War II (7 December 1941-22 September 1943), the Purple Heart was awarded both for wounds received in action against the enemy and for meritorious performance of duty. With the establishment of the Legion of Merit, by an Act of Congress, the practice of awarding the Purple Heart for meritorious service was discontinued. By Executive Order 9277, dated 3 December 1942, the decoration was extended to be applicable to all services and the order required that regulations of the Services be uniform in application as far as practicable. This executive order also authorized award only for wounds received. Executive Order 11016, dated 25 April 1962, included provisions for posthumous award of the Purple Heart. Executive Order 12464, dated 23 February 1984, authorized award of the Purple Heart as a result of terrorist attacks or while serving as part of a peacekeeping force subsequent to 28 March 1973. The Senate approved an amendment to the 1985 Defense Authorization Bill on 13 June 1985 which changed the precedent from immediately above the Good Conduct Medal to immediately above the Meritorious Service Medals. Public Law 99-145 authorized the award for wounds received as a result of friendly fire. Public Law 104-106 expanded the eligibility date, authorizing award of the Purple Heart to a former prisoner of war who was wounded before 25 April 1962. The National Defense Authorization Act for Fiscal Year 1998 (Public Law 105-85) changed the criteria to delete authorization for award of the Purple Heart Medal to any civilian national of the United States while serving under competent authority in any capacity with the Armed Forces. This change was effective 18 May 1998. Close relatives of Purple Heart recipients are eligible to belong to the Ladies Auxiliary of the Military Order of the Purple Heart, which does important work nationally and locally in Veterans’ Hospitals. Further information about the Order and its auxiliary may be obtained from the National Headquarters as listed below. This entry was posted in Uncategorized on April 12, 2008 by admin. “Philly” (Philadelphia, Pa. USA) has a deep tradition in boxing. Being born and raised in Philly, we seem to have either adopted or been given the “Rocky” legacy. When visitors from all over the globe visit Philadelphia, their first point of interest to visit is to “run the Rocky steps”. Amazing! With all the American history and culture that exists in the city – a fictional character that was born in a 1976 (bicentennial year) movie – Rocky wins out? Why does this uplifting “one in a million” underdog who fights for and eventually wins a fictitious World Boxing Championship Belt strike such an emotional chord? I use the Rocky backdrop as an introductio to the story of this famous award, the Championship Belt. … in combat sports such as boxing, mixed martial arts and professional wrestling to signify the champions of the promotion or company, much like the Vince Lombardi Trophy or The Stanley Cup. This was not always the case. The history of this famous award started with boxing, much like the “Rocky” raw fisted struggle of human achievement and triumph. When was the tradition of awarding “Title Belts” started? Thomas “Tom” Cribb (the “Black Diamond”) was one of England’s most celebrated boxing champions in the early 1800’s. He made “milling on the retreat” acceptable as a mode of fighting. Upon his retirement in 1822, he was awarded a lion-skin championship belt, the first unofficial “title belt”. After retirement, Cribb maintained “The Union Arms” on Panton Street in Picadilly, London for many years, until he lost it in 1839. Cribb was inducted into the Ring Boxing Hall of Fame in 1954 and the International Boxing Hall of Fame in 1991. When the modern authorities talk of the heavyweight championship of the world, they are probably referring to the championship belt presented to Sullivan in Boston on August 8, 1887. The belt was inscribed Presented to the Champion of Champions, John L. Sullivan, by the Citizens of the United States. Its centerpiece featured the flags of the US, Ireland, and the United Kingdom. The “Boston Bully,” Sullivan was the most famous sports figure of his day. To honor their hometown hero, Boston fans raised $10,000 for this elaborate trophy. Encrusted with 350 diamonds (now lost) and decorated with Sullivan’s portrait and crossed Irish and American flags, the gold-plated belt has this inscription: “Presented to the champion of champions by the people of the United States.” In 1983 the Smithsonian acquired Sullivan’s belt for its sports history collection. It is impossible to say who the “first” heavyweight champion was, since the sport of boxing goes back as far as recorded history and there have always been large fighters. Even in the bare-knuckle era, “champions” were plentiful. A competing “officially recognized” Championship belt in boxing had its origins in London back in 1909 with the “Lonsdale Belt”. The belt is named after Lord Lonsdale who was patron of the National Sporting Club. The Earl of Lonsdale was a keen boxing fan who supported boxing for many years. 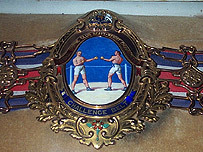 The Lonsdale Belt was a boxing prize given by Hugh Lowther, 5th Earl of Lonsdale. It was originally presented to the champion in each British weight division and the holder could keep the belt if it was won and then defended two times. The belt was first won by Freddie Welsh in 1909 for winning the British lightweight title. Heavyweight Henry Cooper was the first person to win three Lonsdale Belts outright in his seventeen year professional career. The belt is still won today and awarded by the British Boxing Board of Control although to keep it you must win and defend it three times. The belt is crafted from gold and porcelain and is therefore very expensive to produce. The current Championship Belts awarded for boxing has its roots from The Ring (Ring Magazine -founded 1922) who began awarding championship belts in 1922. The first Ring belt was awarded to heavyweight champion Jack Dempsey, the second to flyweight champion Pancho Villa. The magazine stopped giving belts to world champions in the 1990s, but began again in 2002 when it launched its new championship policy intended to reward fighters who, by satisfying rigid criteria, can justify a claim as the true and only world champion in a given weight class. No other regularly-awarded belt (awarded to a champion upon becoming champion) prior to this one. In boxing, the individual organizations such as the World Boxing Council, The World Boxing Association, the International Boxing Federation and the World Boxing Organization each have their own unique championship belt that they award to the champions of each weight class. 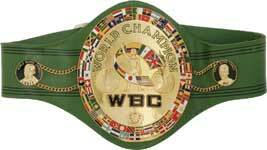 Boxers, especially the World Champions, strive to win the belt of all 4 organizations to unify their weight divisions. Champions maintain permanent possession of these belts even upon losing their title, with a new belt made when a new champion is crowned. Unlike Professional Boxing, Professional Wrestling has numerous World Champions and even more regionalized and specialized Championship Belts. The generally recognized World Championship Belts are those of World Wrestling Entertainment and The National Wrestling Alliance. The National Wrestling Alliance recognizes numerous regional Championship Belts such as The NWA North American Championship and The NWA British Commonwealth Championship. World Wrestling Entertainment currently has 3 Main Champions. The WWE Championship is the main championship belt of its RAW brand, the World Heavyweight Championship is the main championship belt of the SmackDown! brand,and the ECW Championship is the main championship of the ECW brand. The RAW and Smackdown! brands also have their own separate tag team Championship Belts and various lesser belts, but the ECW brand has one title. Generally, boxing has many fewer uniquely designed belts than wrestling. The 4 major boxing governing bodies generally use the same belt design for all their champions, whereas wrestling companies use different styles for each Championship. The WWE has had 11 different belts to represent their World Title, The National Wrestling Alliance has stayed with the same design for over 30 years, sans the period between 1986-1993 when the “Big Gold” belt was the NWA Worlds Heavyweight Title Belt. Beltmakers often create belts that not only set the Championships apart from the others, but become huge collector items as well. These custom belts are generally made of Leather over-sized belts, with cast metal ornate belt buckles and or medallions. These belts are accented by numerous costume and real jewelry components to add to the presentation. The variations over the years are countless, with each being uniquely designed and manufactured. Special thanks to wikopedia.com for contributing information. This entry was posted in Uncategorized on April 3, 2008 by admin.